Social media spending is projected to balloon to 21 percent of marketing budgets in the next five years. But what will social media marketing even look like five years from now? If the last six months are any indication, change is the only constant. Here are the big-picture shifts going on in social media marketing right now. To understand the current state of social media for business, the TrackMaven team used our own software platform to do the richest analysis of social media marketing to date. We analyzed the social media content for over 40,000 companies across 130 major industries from January 1, 2016, through June 30, 2016. Cumulatively, this analysis includes 51 million pieces of content on four major social networks: Facebook, Twitter, Instagram, and LinkedIn. Using this data, we aggregated the impact of brand-generated social media content by network, and normalized for differences in follower size and posting frequency across the 40,000 brands in our dataset. 1. Across the first half of 2016, the average brand engagement per social media post decreased on Instagram, Facebook, and LinkedIn. 2. The average engagement ratio per brand is 10 times higher on Instagram than on Facebook — but is declining quickly. Across the first half of 2016, brand engagement saw the sharpest decline on Instagram (25.85 percent), followed by Facebook (8.27 percent), and LinkedIn (7.6 percent). 3. LinkedIn saw a 30 percent rise in the average monthly posting frequency per brand, but remains the major social network with the lowest posting frequency for brands. On Twitter, however, the average number of tweets per brand per month fell by 8 percent. Take a look for yourself. The summary graph below provides a macro view of the state of social media marketing for business. 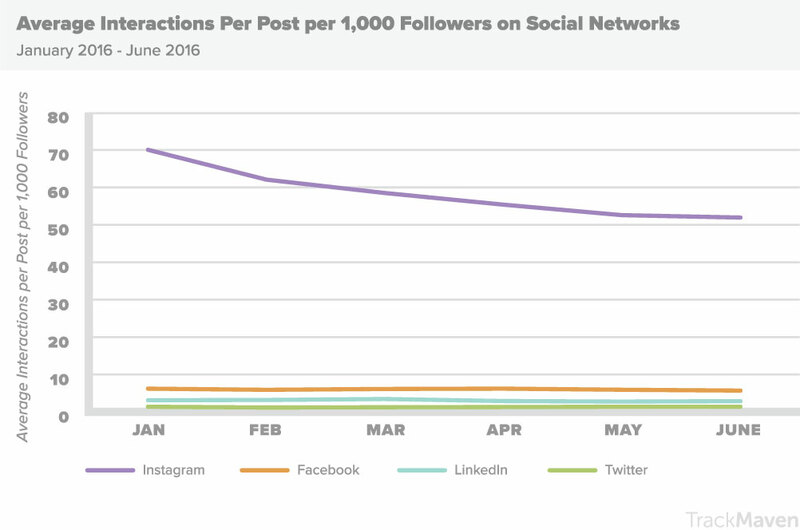 It plots the average engagement ratio — or average interactions per post per brand per 1,000 followers — for businesses on social networks from January 2016 through June 2016. First, you might notice that the overarching trend in engagement is downward. In fact, brand engagement went down across the first half of the year on Facebook, LinkedIn, and Instagram. The exception: Twitter’s engagement ratio, however, surged slightly across the first half of 2016, with an uptick of one percent. The slight surge in the engagement ratio for businesses on Twitter can be seen more clearly once Instagram is removed from the graph. Businesses on Twitter (green) saw the highest engagement levels in June of 2016, with an average engagement ratio of 1.39. LinkedIn and Facebook saw surges in the average engagement ratio for businesses on their networks in March 2016 and April 2016, respectively, but have since fallen. The engagement ratio for businesses on Instagram is more than 10 times greater than that on Facebook across the first half of 2016. However, the average brand engagement ratio also decreased the most on Instagram. As Instagram made major moves towards monetization across the first half of 2016, including the introduction of a ranking algorithm and business profiles, the average engagement seen by brands cascaded by 25.85 percent. This is a familiar pattern in the world of social media marketing. A new social network emerges, becomes popular with users, and becomes popular with advertisers alike (because of course, you don’t see one without the other). Brands and influencers that are early adopters on the new network reap the benefits of a “free lunch” period when there’s less competition to be heard. But then, the network moves to monetize its user base, and as it does so, brands have to pay to play on the network. Engagement for the average brand comes back down to earth as a result. We’re seeing this marketing wave on Instagram right now. Despite competitive platform updates like the introduction of the Snapchat-like Instagram Stories feature, marketers should expect to see declines in organic engagement on Instagram in the months and years to come. Let’s shift to see how brand behavior has changed across the first half of 2016 by looking at the average posting frequency for brands on each network. Across the first half of 2016, there is a slightly upward trend in the volume of social media content from brands, with a few notable exceptions. First and foremost, as you might expect, brands post the most often on Twitter (green). Brands tweet 450 times per month on average, or around 15 tweets per day. Brands post 200 times on Facebook per month on average, or between six and seven posts per day. 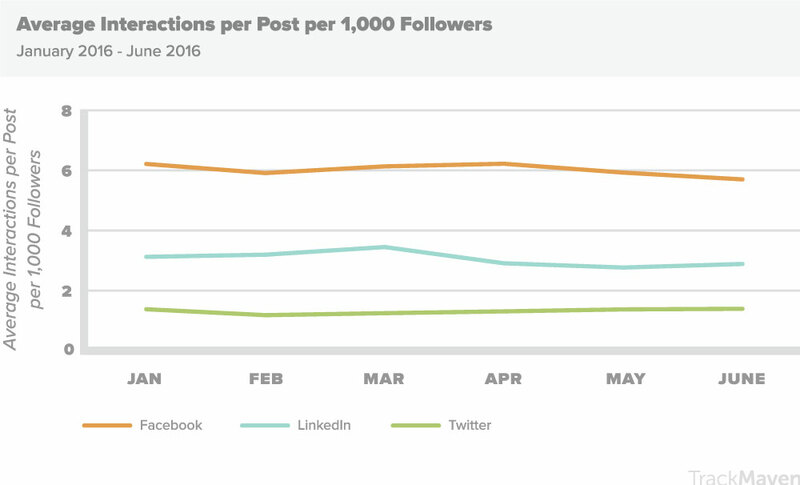 Brands post 150 times on Instagram per month on average. The lowest-frequency channel for brands is LinkedIn; brands post 60 times on LinkedIn per month on average. That being said, there are some interesting trends when we take a look at how the average output of content has changed on each social network across the year so far. 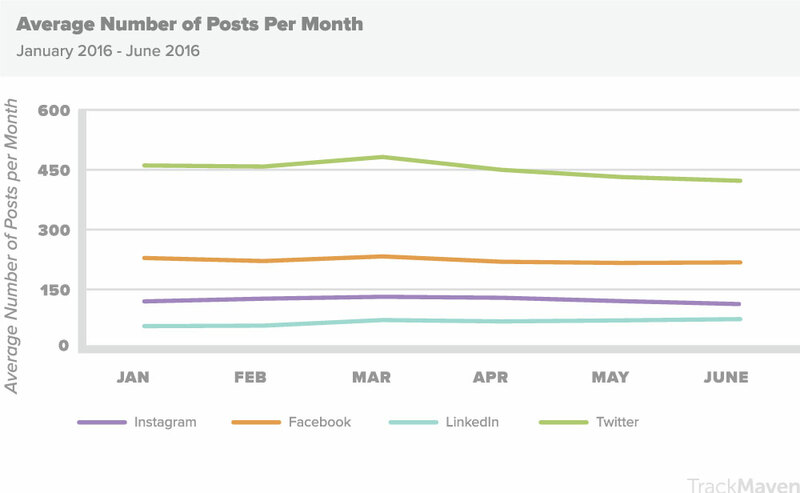 The average monthly posting frequency for businesses remained relatively steady on Facebook and Instagram across the first half of 2016. On Twitter, however, the average number of tweets per brand per month fell from a peak of 482 tweets per brand on average in March of 2016 to 422 tweets per brand on average in June of 2016. We know Twitter has made many changes to its platform to strike greater relevance, including the introduction of an algorithm, which could certainly be a factor underlying the dip in posting frequency. Stagnating relevance among Twitter users could also be the culprit; eMarketer recently reduced its estimate for Twitter’s U.S. usage growth this year from 8 percent down to 2 percent. On LinkedIn, however, the average monthly posting frequency on business pages rose 30 percent across the first half of 2016, from 58 posts per month in January 2016 to 76 posts per month in June 2016. Put differently, the competition for businesses to stand out on LinkedIn is getting steeper. 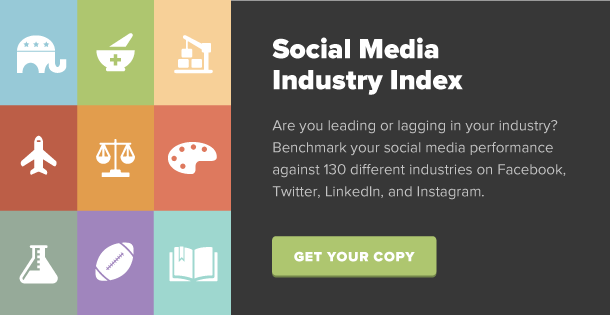 For a deeper analysis of the latest trends in social media for business, download your free copy of the 2016 Social Media Industry Index, which includes benchmarks for social media audience size, posting frequency, and engagement for businesses in 130 different industries.